The textile industry is majorly being driven by the rising production of textiles and increasing trading of textile products. The production and trading of textiles requires testing, inspection, and certification services to ensure that they conform to quality related standards, which also helps them gain recognition worldwide. . According to the Apparel Export Promotion Council (AEPC), the exports from the Chinese textile industry were estimated to be worth USD 274 Billion in 2013 and USD 246 Billion in 2012. The global TIC is expected to reach USD 7,221.01 Million by 2020, at an estimated CAGR of 4.6% between 2015 and 2020. The market is expected to be driven by introduction of new regulations and standards in the textile sector, technological innovations in the textile sector, and increase in the worldwide trading of textiles. Additionally, the market for textile certification is expected to grow at the highest CAGR of 8.1% during the forecast period due to the increase in trading of textiles. This report profiles the major players which are active in the Textile Testing Market. The key players profiled in the report are SGS Group (Switzerland), Bureau Veritas SA (France), Intertek Group Plc (U.K.), TUV SUD Group (Germany), TÜV Rheinland Group (Germany), AsiaInspection Ltd (Hong Kong), British Standards Institution (BSI) Group (U.K.), Centre Testing International (CTI) (China), Hohenstein Institute (Germany), SAI Global Ltd (Australia), TESTEX AG (Switzerland), and Eurofins Scientific (Luxembourg). This report categorizes the global testing, inspection, and certification market on the basis of textile application and geography, along with forecasting the revenue and analyzing the trends in the said market. In this section, the market has been segmented based on the textile applications for which the testing, inspection, and certification services are used. These include textile testing, textile inspection, textile certification, and toys. The market for textile application of TIC services has been further segmented into chemical testing, color fastness test parameters, physical test parameters, and others. The Textile Testing Market has been split in to four regions based on geography, which include North America, Europe, Asia-Pacific, and ROW. Testing, inspection, and certification (TIC) services helps manufacturers ensure that their products conform to technical safety and quality related standards and regulations, which in turn increases the marketability of their products and reduces the pre-production cost of textiles. Examination of traded goods purchased from buyers by end-users and checking whether they comply with the buyer’s specification and expectations comes under inspection services. Certification of textile services provides confirmation of test or inspection done against governments and international standardization institutions’ set of pre-defined standards. Certification of textile helps manufacturers trade globally, as it assures buyers that a product complies with the technical safety, performance, and quality related regulatory standards. 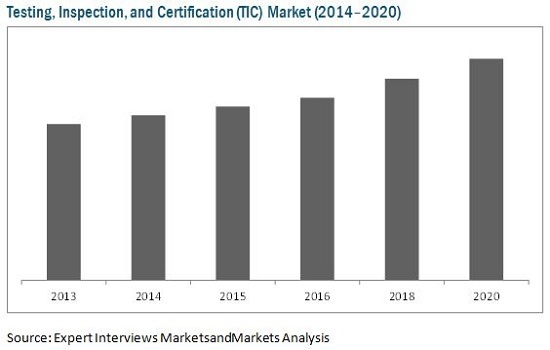 The testing, inspection, and certification (TIC) market is expected to reach USD 7,221.01 Million by 2020, growing at a CAGR of 4.6% between 2015 and 2020. Textile Testing Market players such as SGS Group (Switzerland), Intertek Group plc (U.K.), and TUV SUD (Germany) have been focusing on geographical expansion, so as to broaden their portfolio and geographical presence. For Instance in February 2015, the SGS Group (Switzerland) opened a new softlines testing laboratory in Tianjin (China). The new lab offers testing services for various types of textiles, apparel, and leather products. Increasing export of textiles from developing regions and growth of the technical textile market are some of the factors driving the testing, inspection, and certification (TIC) market. Small to medium sized TIC companies face challenges in terms of receiving accreditation as it requires heavy investment. However, various government organizations are providing incentives in the form of funds and relaxation of accreditations for the SMEs in the TIC textile market, as the latter are required to make huge investments to get accredited by accreditation bodies such as International Organisation for Standardization (ISO) and American Society for Testing for Materials (ASTM). The global testing, inspection, and certification (TIC) market has been segmented into North America, Europe, APAC, and RoW. The studied market in North America has been further segmented into the U.S. Canada, and Mexico. The European Textile Testing Market has been segmented into Germany, Switzerland, U.K., Turkey, and others. Countries such as China, Japan, India, Bangladesh, and others are included in the APAC region. The said market in ROW has been further segmented into the Middle East, South America, Africa, and others. Europe was the leading region in terms of the market share in 2014, due to the presence of prominent market players such as SGS Group (Switzerland), Bureau Veritas Group (Belgium), Intertek Group PLC (U.K.), TUV Rheinland Group (Germany), and others. Some of the key players in the Textile Testing Market include AsiaInspection (Hong Kong), BSI Group (U.K.), Bureau Veritas Group (Belgium), CTI (Centre Testing International) (China), Hohenstein (Germany), Intertek Group PLC (U.K.), SAI Global Ltd. (Australia), SGS Group (Switzerland), Testex AG (Switzerland), TUV Rheinland Group (Germany), TUV SUD Group (Germany), Eurofins Scientific (Luxembourg).